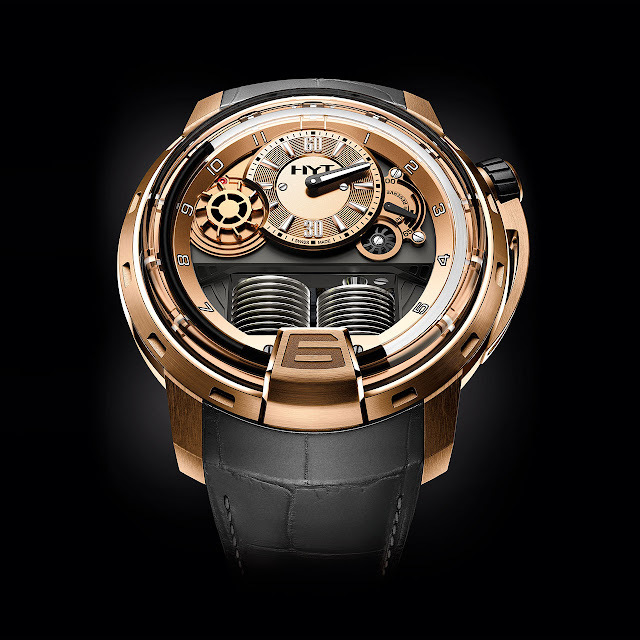 After using high-tech, outstanding and classic designs and materials, HYT is now exploring noble metals, by presenting its first ever case made in 18K pink gold. This colour in fact dictates the entire design of this H1, with its dial displaying pleasing contrasts between the warmth of gold and distinctive black indications. For the first time, the fluid hours indicator of the H1 Full Gold is also black. The central concept of the HYT brand consists in replacing the hours hand by a coloured fluid that moves up and down in a capillary: a less than one-millimetre glass tube. The deep black liquid advances steadily until 6 pm and then switches to retrograde mode and flows back to its initial position (6 am). Like the four other colours developed by HYT, the black shade has its own specific properties. 50-piece limited edition. Mechanical hand-wound, exclusive HYT calibre, bridges hand-chamfered and adorned with a Côtes de Genève, rhodium-plated bellows, 35 jewels, 28,800 vib/h, 65-hour power reserve. Hours displayed by a black retrograde fluid, off-set minutes, small seconds, power-reserve indicator. Beadblasted satin-brushed 18K 5N pink gold, 48.8 mm. Domed anti-reflective sapphire crystal. Sapphire caseback. Water-resistant to 100 metres (10 bar/330 ft). Light grey alligator. Titanium folding clasp.